HAVE you got a bicycle collecting dust in a corner of your storeroom? Or have you seen a discarded bike somewhere? Here’s a chance to turn that piece of scrap metal into a valuable gift this Christmas. Since January, Bike Aid, a non-profit organisation in Singapore, has been collecting old bicycles for poor children in the rural villages of Thailand. Bike Aid, which was formed in 1992, organises bike rides every two years to raise funds for needy organisations likethe National Kidney Foundation. It was a bike trip to southern Thailand last year that gave birth to this bike collection project. 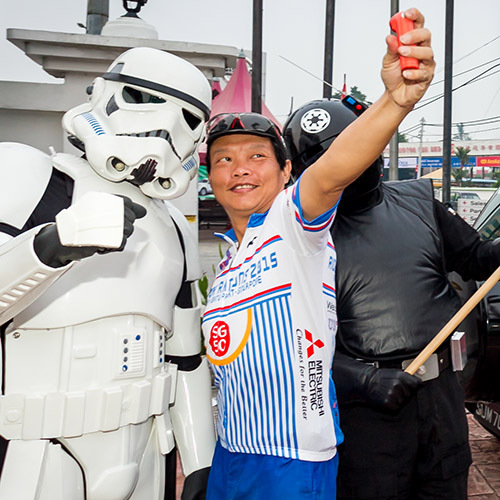 Said Mr Lai: “While there, we came across this newspaper report about the Thai Cycling Club collecting old bicycles for the children. “So we got in touch with them and started our own collection.” So far, Bike Aid has collected 138 bicycles which were sent to Thailand in September. The first batch of bicycles were given to pupils of the Lopburi provincial school.When the pupils complete their education, they have toreturn the bikes so that other children may enjoy the samebenefits. Bike Aid will continue to collect bicycles till March 31, 2000.They already have 46 bikes.